She was the daughter of James Richmond J Greaves and Emily Poppitt. Marriage Elsie was married to Ronald Rupert Greaves, son of James Richmond J Greaves and Emily Poppitt. Married Name Her married name was Greaves. Birth 13 January 1771 Sarah Cutler was born on Sunday, 13 January 1771 at South Hayling, Hampshire, EnglandG. She was the daughter of Thomas Cutler and Martha Bean. Marriage 27 October 1794 Sarah was married to John Couzens on Monday, 27 October 1794 at St Mary's Church, South Hayling, Hampshire, EnglandG. Death 7 June 1849 Sarah Cutler died on Thursday, 7 June 1849 at Havant ? at age 78. Married Name 1794 As of 27 October 1794, her married name was Couzens. Birth 5 November 1775 John Couzens was born on Sunday, 5 November 1775. Marriage 27 October 1794 John was married to Sarah Cutler, daughter of Thomas Cutler and Martha Bean, on Monday, 27 October 1794 at St Mary's Church, South Hayling, Hampshire, EnglandG. Death 11 November 1844 John Couzens died on Monday, 11 November 1844 at Havant ? at age 69. 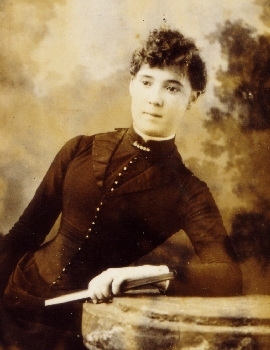 Charlotte Lucinda James, née Moore. Photograph provided by Jan Tabler. Married Name 1890 As of 23 July 1890, her married name was James. [S260] Marion Joyce Purnell, "Simon Peter Purnell's Descendants," e-mail to Robert Mote, 2 December 2001. Birth 26 May 1901 Sydney Morton James was born on Sunday, 26 May 1901 at Gulgong, NSW, AustraliaG. He was the son of Andrew Louis James and Charlotte Lucinda Moore. Death 15 April 1970 Sydney Morton James died on Wednesday, 15 April 1970 at Bateau Bay, NSW, AustraliaG, at age 68. [S2] Index of BDM records, NSW BDM, Place of Registration: Burwood; Year: 1924; Number: 1337. Married Name 1923 As of 15 March 1923, her married name was James. Birth 12 March 1868 Alice Martha Allan was born on Thursday, 12 March 1868 at One Tree Hill, NSW, Australia. Marriage 21 March 1888 Alice Martha was married to Ernest Alister James, son of John James and Henrietta Ashton, on Wednesday, 21 March 1888 at Gulgong, NSW, AustraliaG. Death Alice Martha Allan died at AustraliaG. Married Name 1888 As of 21 March 1888, her married name was James.